Point Blunt is a prominent point marking the southeast corner of Angel Island, and a place where some of San Francisco Bay’s most powerful tidal currents bend, mix and sometimes collide. Rowers have discovered that an easy rounding is possible by passing inside of the last rock that sits off the point. The only trick to the route is a shoal inside the outer rock that is below water on most days. The hidden rock can be avoided if you know where it is and pay attention to your course. Below is a description and diagram of the recommended way to round, and a series of photos. Reminder: Club rowers are restricted to Richardson Bay until they have been rough-water certified. Note: Always make this rounding with care, even after you’ve learned the route well. Anytime you are rowing so close to rocks or obstructions, a surprise wave or current can bring you into contact with rock and cause damage. Take it slow and check your position and heading frequently! Pt. 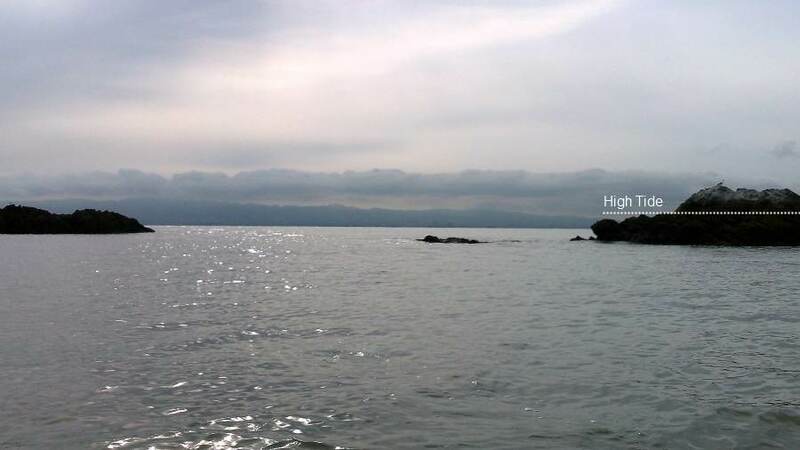 Blunt is, ironically, a rather acute point of land ending in a series of tall, “haystack” shaped rocks and many smaller and lower rocks, that are strewn out into the water. The tall haystacks are easily seen from a distance. The outermost rock is pyramid shaped, from 6 to 12 feet tall and 20 to 40 feet across, depending on tide. This rock is set about 50 yards out from a much broader and lower rock. The gap that separates the two is your route around Pt. Blunt. A shelf of rock extends inward from the pyramid-shaped outer rock. The shelf, with a jagged knob on the end, is below water except in extreme low-tide. Even at high-tide, however, the long swells that are common here can drop a passing shell onto the sunken rock. The safe route is to avoid the rock altogether. The easy route around Blunt just curves around the low, inner rock, staying at least 30 feet away from the outer rock. You do not need to “hug” the inside rock, just stay closer to it than the outside rock. Going from West to East: Be sure to start your rounding from the area in front of the westernmost “haystack” rock. If you are rowing up the shoreline you are already in position. If you have rowed a “wider” route, come in closer to shore before beginning to make the rounding. From this angle the shoal is out of your way and the clear channel is wide. Go on around and keep curving to the north to begin rowing up the east side of Angel. Going from East to West: Coming this direction you will be rowing in an arc around the tallest of the haystack rocks and aiming to round the low rock. 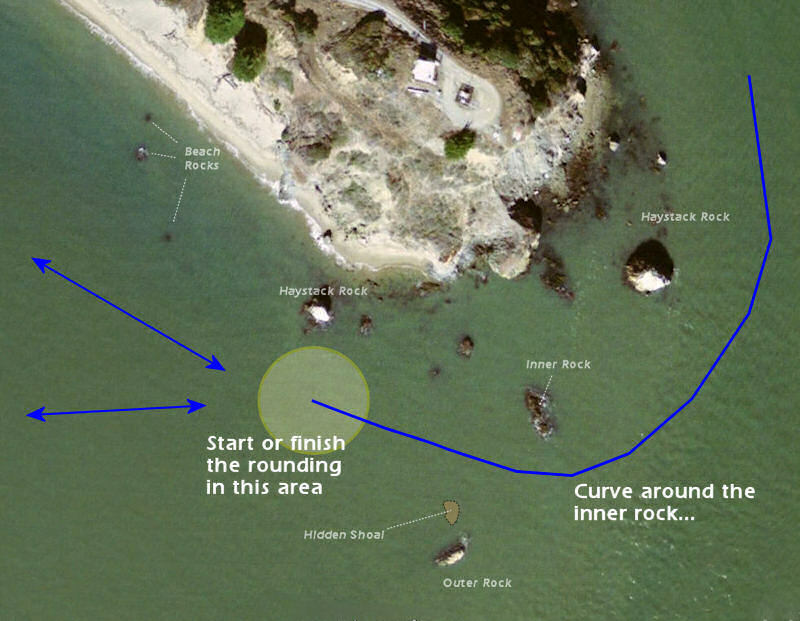 Stay a bit closer to the inside of the channel than the outside, and keep curving around to reach the zone near the other tall rock, as indicated in the diagram. This will get you clear of the shoal. There is the “trap” you must avoid. Rowers don’t like rowing through tight spaces, and, as you come up from the east side you will see a roomy gap and wide-open waters beyond. There is a strong temptation to charge through out to the bay beyond. This route however, will take you near or over the hidden shoal. Similarly, if you are coming from the other direction, a bit off the shore, you too will see what looks like an open gap between the rocks and be tempted to hurry straight through. From that angle, however, the hidden rock is directly in your way (see the photos below). Aim instead a bit to the left, towards the tall rocks, and get in closer before turning to make the rounding. From that angle of approach the shoal is out of your line. It’s not as hard as it sounds: The passage is roomy, about as wide as the entrance to our home marina or the Strawberry Channel, and the currents are usually mild. If you have a chance to go there on a low tide, you should be able to see the rock and once seen, you will know how to avoid it. A few times per year the tides are especially extreme and the low-tides, aka “minus tides”, will expose the otherwise hidden shoal to view. Some of these photos were taken during just such a time, to make the location of the shoal apparent. On normal tides you will not see the shoal above water. Don’t expect to see it as you do in these photos. Just know that it is there. Approaching from the west staying close to the shore, the shoal , visible at this very low tide, is off to the right. You have a nice wide channel open to you. The same approach as above, from the west, closer in. Plenty of room from this angle. Remember that on a normal tide the shoal will be covered and not visible. Approaching from the west but further out from the shore, one is tempted to hurry straight through the apparent gap, but the shoal is right in your way from this angle. Instead, aim to the left toward the large haystack shaped rock, get in closer, and then turn to pass through on the angle shown above. A closer look from further out. This angle or approach brings the shoal, normally covered, into your path. A typical view on a normal tide. The shoal is covered, and the morning sun is in your eyes. Mentally divide the gap into thirds and avoid the right-most third. An overhead view with west at the bottom and east at the top. The shoal is visible as a smudge. Note the ebb-induced roughness at the top. By slipping through the slot and curving around the tall rock you will avoid the tidal rip. An overhead view at high-tide, and in a flood current. North is at top. You can see the tidal rough-water in the lower right.